Maybe under that judgement is the wistfulness of the kid with too much homework and a curfew who wishes he could join in the fun. If I can’t have fun, then having fun must be wrong. Right? Tonight I landed right in the middle of the surging crowd of cyclists riding up Division St. and just fell in without giving it too much thought. We rode up Valencia to 22nd, then to Mission St., looped back to Valencia and up Market toward the Castro. There must have been 1000 cyclists in a sprawling caravan of tinkling bike bells and blinking red tail lights as far ahead as I could see. It was an unexpected feeling of solidarity and closeness. There were a few DJ’s with huge speakers on bike trailers booming and I’d find one I liked the sound of and keep pace with it pedaling in time to the beat. When you’re a driver among other drivers, you’re alone in your cacoon of music or silence or your cell phone conversation. If you interact with other drivers it’s often out of anger and righteousness. They disobeyed some rule or did something stupid, so you become irritated and honk at them. In the transition from small virtual family to large mobile village comes not just stability, but safety. I guess that’s why they call it Critical Mass. I’d never realized that constant note of fear that plays in the background every time I ride my bike on a road shared with cars, fear that a car might run a stop sign or make a turn, the uneven stakes in terms of what it would mean for the car and what it would mean for me. And now that note of fear is gone, and that absence is the most unexpected and exhilarating aspect of the experience. We get to feeling that a car is an essential tool, or even an inalienable right. Anyone who interferes with your car is disrespecting you as well as the rules. But who invented those rules? Who benefits by them? Do cars have rights? Once in I remember a cab driver complaining to me about the foot traffic in American cities, all the jaywalkers. In his country, he told me in heavily accented English, the cars get more respect. The pedestrians know that if they don’t jump out of the way, they will be killed by the cars. In your country, he said, there are too many laws against killing the people. Well, we choose to have a system where hitting people with cars is not cool. We could also have system where it was easier and safer for people to ride bikes. It’s up to us. Maybe in regards to them, Critical Mass doesn’t measure up. To those who are already bicycle believers, it’s an affirming experience. But for those who are dependent on their cars, or who just believe that they are, we probably hadn’t opened their mind to other points of view. 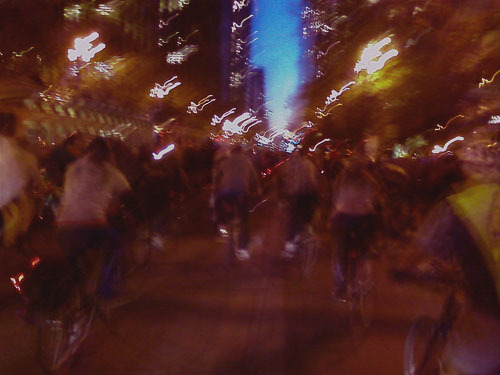 More likely that they felt confirmed their sense of their own righteousness — and victimization — in the face of irresponsible and raucous people who had nothing better to do on a Friday night than ride their bikes around, having way too much fun. Photo Credit: luxomedia via Creative Commons Non-Commercial/Share-Alike license.